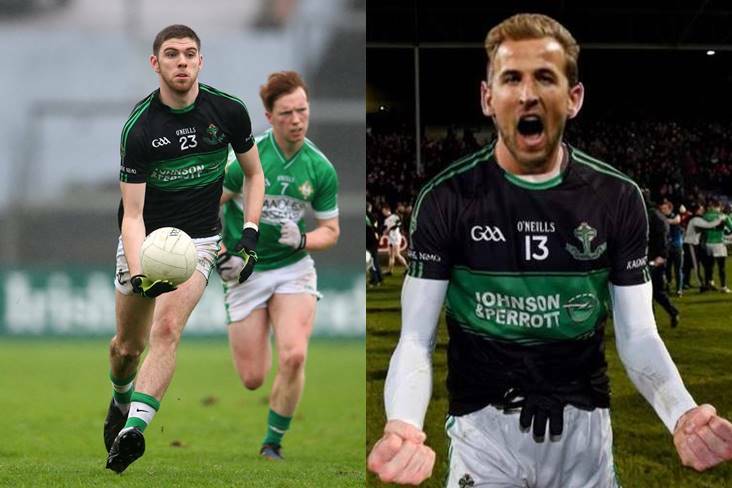 Nemo Rangers' Luke Connolly and Tottenham Hotspur and England striker Harry Kane in the colours of the Cork champions. Nemo Rangers were back in championship action yesterday less than a month since finishing second best to Corofin in the All-Ireland Club SFC final. Luke Connolly netted the goal (although it seems that Harry Kane has since claimed it! (see below)) as they got the defence of their Cork SFC crown off to a 1-16 to 0-5 winning start against Clyda Rovers last night. Meanwhile, two Conor O'Driscoll goals boosted Castlehaven to a 2-15 to 2-10 victory over Dohenys and O'Donovan Rossa got the better of Carrigaline by 1-17 to 3-6. The Cork SFC continues today with 2016 winners Carbery Rangers scheduled to face Clonakilty while Ballincollig, who took the title in 2014, are up against Illen Rovers. Newcestown will face Valley Rovers. The venue and time for that game has been changed from Bandon to Pairc Ui Rinn at 5pm. On Friday night, last year's defeated finalists St Finbarr's overcame Carrigaline on a scoreline of 1-17 to 3-6.